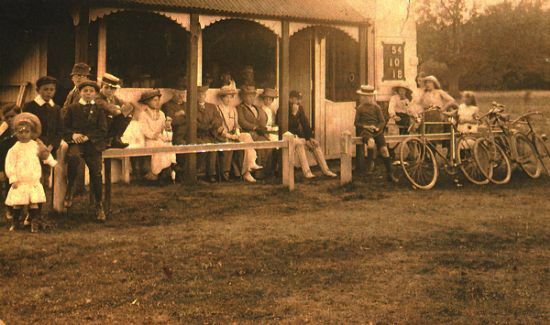 Spectators enjoy watching a match seated in what may well be the first cricket pavilion at Stillington. Left to right, backrow - ? ?, Tom Bradley, Charles Denton, Ned Gibson, William Appleby, Spencer Corbett,??,? ?,A Spencer. Front row - ? ?, Arthur Young, ? ?, Frank Denton, ??. Backrow - Donny Thompson, ? 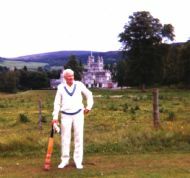 ?, Arthur North, ? ?, Charles Denton, George Scaife. 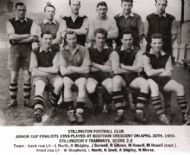 Front row - Rich Wood, F. Wilson, William Appleby, Frank Denton, Algie Richardson, Arthur Young. Left to Right, backrow: Spencer Corbett, George Wood, Alan Redshaw, Norman Wood, Bill Burnett, Arthur Barker, Tom Horner. 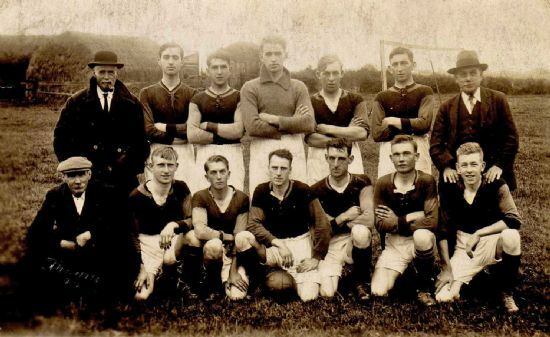 Front Row: Fred Scaife, Owen Atkinson, Billy Redshaw, Arthur Denton, Rich Wood, John Horner, George Burnett. 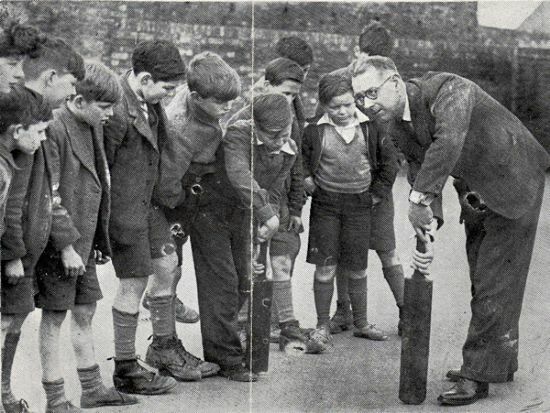 Charles Denton, Headmaster of Stillington School, gives pupils a batting demonstration. 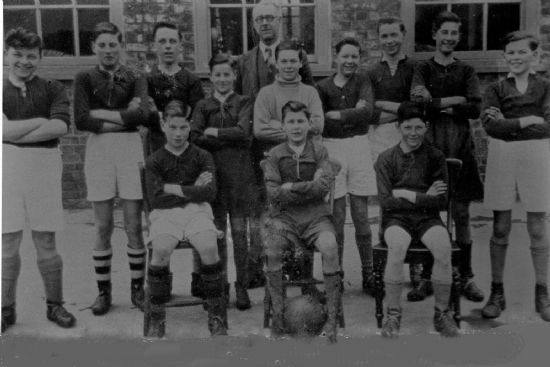 Left to right, backrow: Norman Morse, Les Sanderson, Michael Green, Charles Denton (Headmaster), Barry Manson, Lawrence North, Maurice Borwell, Eric Mattison. Middle row: Keith Little, Tony Wyrill. Front row: ? Hayes, Sydney Lusher, Brian Jackson. 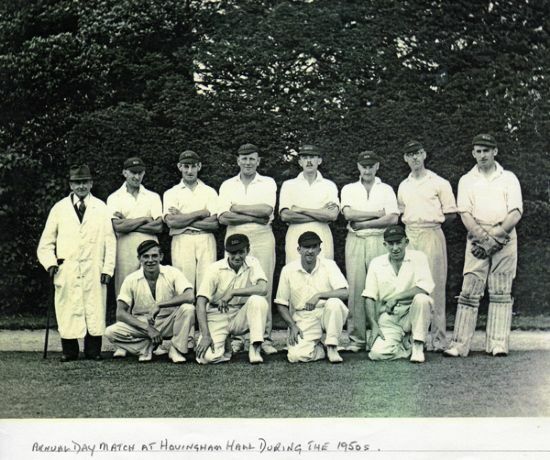 Annual Match Day at Hovingham c1950. Left to right, backrow: Tom Horner (umpire), Eustace Burnett, Rich Wood, Arthur Midgley, Leslie Moreland, Henry Otterburn, Charles Denton, Norman Wood. 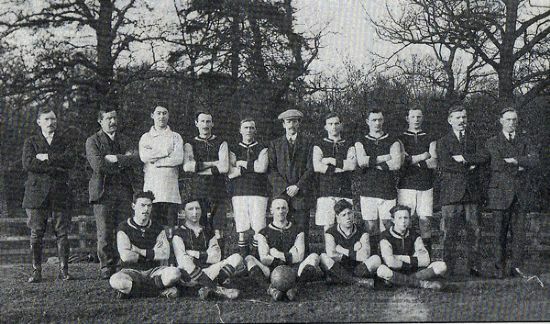 Front row: Jack Scaife, Cecil Wood, Cecil Hugill, Bill Burnett. 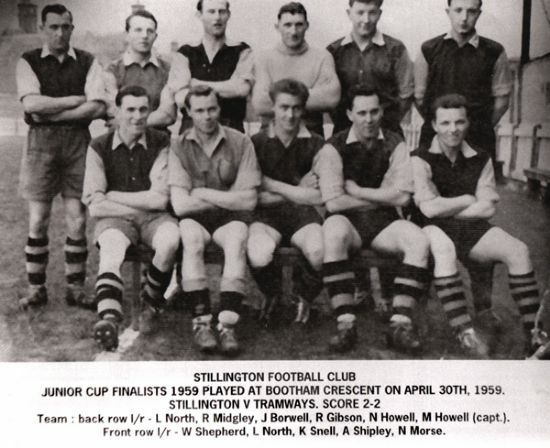 The team who played against Tramways in the Junior Cup final at Bootham Crescent 30/4/1959. The score was two goals each. Left to Right Backrow - Les North, Ray Midgley, Jack Borwell, Robert Gibson, Neville Howell, Mervin Howell (Captain). 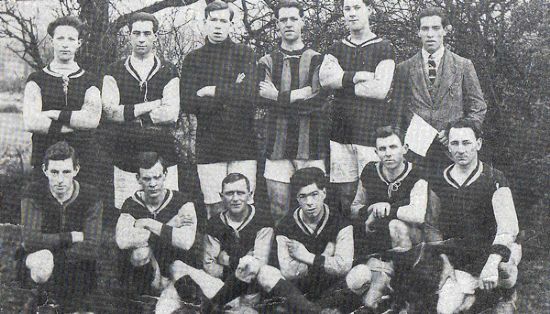 Front row - William Shepherd, Lawrence North, Keith Snell, Alan Shipley, Norman Morse. 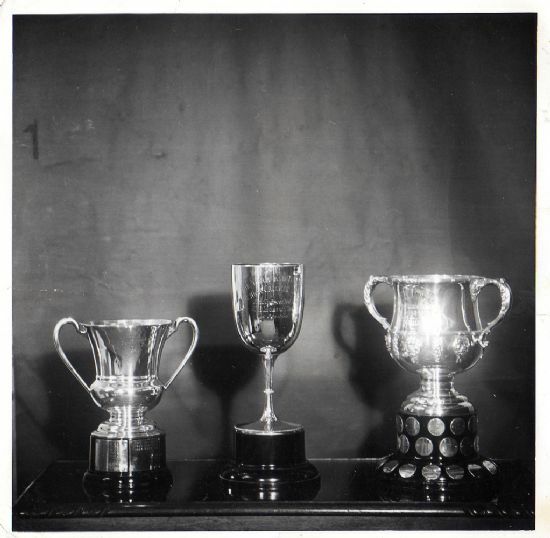 Three cups were won by Stillington cricket teams in one fantastic season. 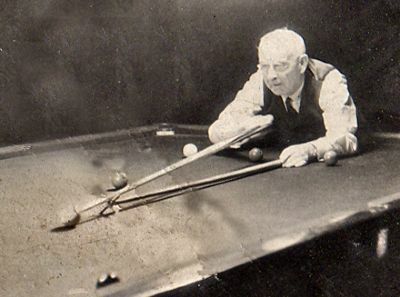 The billiards world champion, known as 'The Cannon King', giving a demonstration of his skills during an evening as a guest at the newly opened Stillington Sports and Social Club in 1963. More of Sam's Sporting exploits to follow! 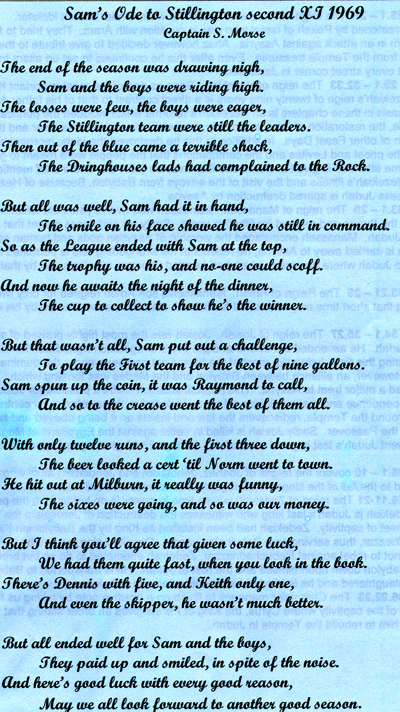 Sam Morse, Stillington's oldest resident to date at the grand age of 95, wrote this ode in 1969 about the game between Stillington first and second teams. 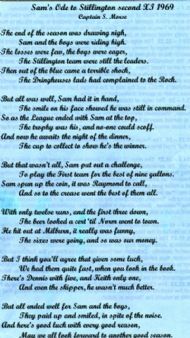 Sam, the Captain of Stillington second eleven at the time, challenged the first team in the belief his team would knock them for six!